The New England Patriots rallied from a 28-3 third-quarter deficit to shock the Atlanta Falcons in the Super Bowl. Clemson won one of the most riveting games in college football history with a come-from-behind touchdown pass to beat Alabama in the final seconds of the College Football Playoff National Championship. The Connecticut women’s basketball team’s 111-game winning streak came to an end in the Final Four at the hands of Mississippi State. And the Golden State Warriors dominated the Cleveland Cavaliers to win the NBA title in the third consecutive Finals meeting between the two teams. Yet 2017 will be most remembered as the year of athletes and activism. A professional football player claimed collusion. President Donald Trump weighed in with controversial remarks. And the true meaning of why players protested was twisted during prime-time debates. The national anthem has long sparked controversy, from the raised fists of John Carlos and Tommie Smith on the podium during the 1968 Olympics to protest the conditions of black Americans to Mahmoud Abdul-Rauf being suspended in 1996 for refusing to stand for a flag that he called a symbol of oppression to Knox College basketball player Ariyana Smith lying down during the song before a game in 2014 to protest the shooting of Michael Brown. Colin Kaepernick: Had he been allowed to play in 2017, would Kaepernick have emerged as the same player who carried the San Francisco 49ers to the Super Bowl in 2013? But Kaepernick remaining steadfast in his beliefs for social justice became the storyline of the 2017 NFL season. And his lingering unsigned presence turned him into a martyr. Incredibly, Kaepernick accomplished that by remaining silent for most of the year. 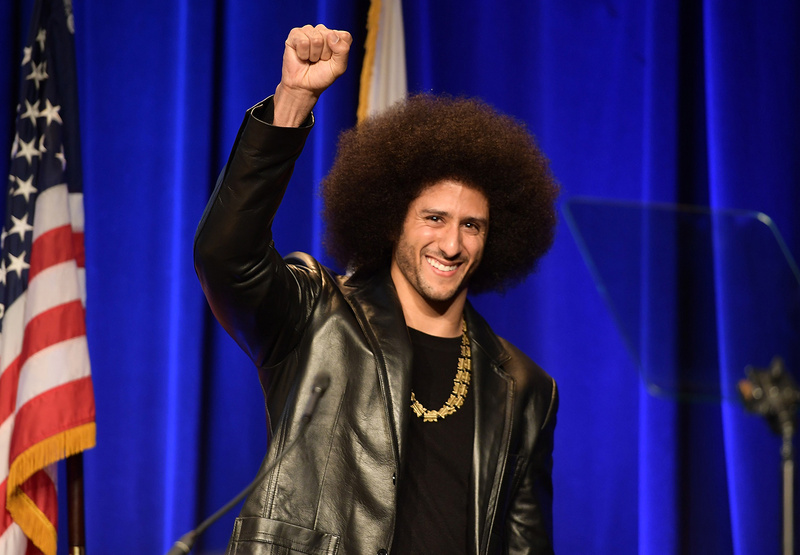 But his willingness to risk his livelihood by going all-in with his protest during the 2016 season earned him honors that include GQ Citizen of the Year and Sports Illustrated‘s Muhammad Ali Legacy Award. Honoree Colin Kaepernick speaks onstage at ACLU SoCal Hosts Annual Bill of Rights Dinner at the Beverly Wilshire Four Seasons Hotel on Dec. 3, 2017, in Beverly Hills, Calif. Despite football fans being teased, Kaepernick was never close to being signed, and his filing a grievance against the league likely means he’ll never again suit up in the NFL. But Kaepernick now has a legacy that will last longer than his NFL skills probably could have ever taken him. It wasn’t the first time James had taken aim at the president. After last year’s presidential election, James decided not to stay at the Trump SoHo hotel with his teammates. That decision led so many professional sports teams to stop staying at Trump properties that the SoHo hotel earlier this month dropped the Trump name. Curry, prior to that comment, had demonstrated as much thuggishness in his career as Wayne Brady or Bryant Gumbel. His willingness to step into the political minefield by going after the CEO of his shoe company was shocking. 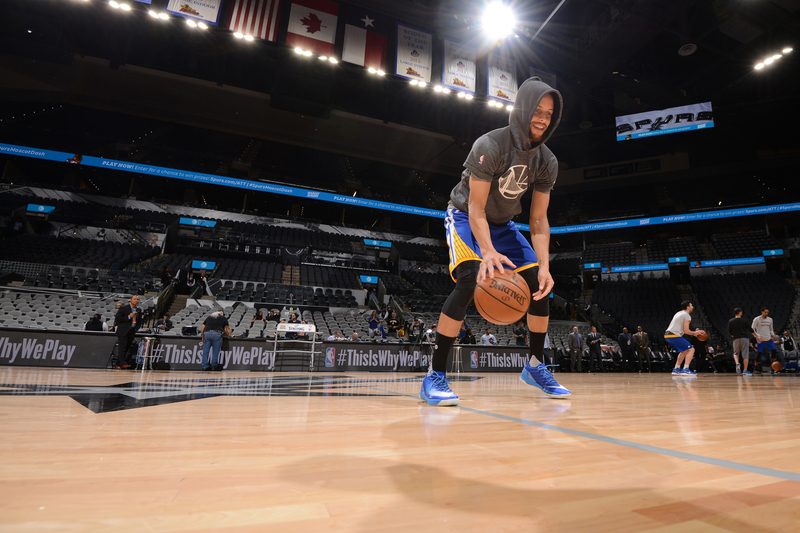 Stephen Curry #30 of the Golden State Warriors warms up before the game against the San Antonio Spurs on March 29, 2017 at AT&T Center in San Antonio, Texas. Maybe Curry isn’t the most prominent voice among athletes. But he has shown signs of being an emerging voice. The Los Angeles Sparks (and other players in the WNBA): Many don’t realize that WNBA players were taking a stand about conditions in this country long before Kaepernick took a knee. After Philando Castile was killed by a police officer in St. Paul in 2016, Minnesota Lynx players spoke up during a news conference while wearing T-shirts with the words “Change Starts with us. Justice and accountability” on the front and the names of Castile, Alton Sterling and the logo of the Dallas Police Department (who had members of the force killed in an ambush), and “Black Lives Matter” on the back. 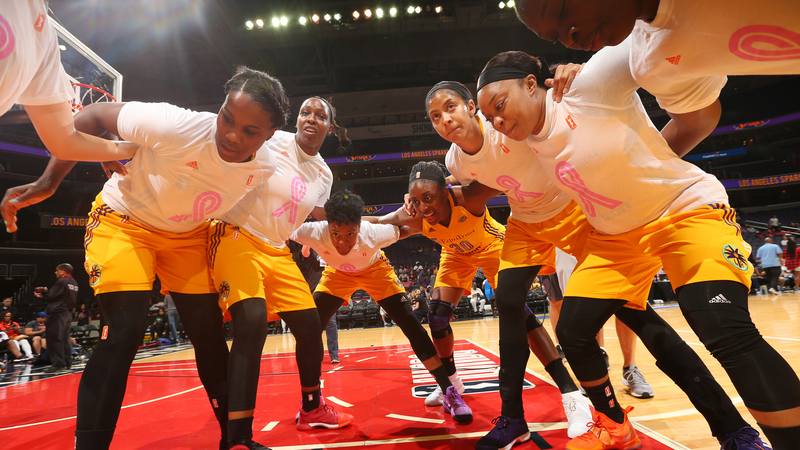 The Los Angeles Sparks huddle before the game against the Washington Mystics on August 16, 2017 at the Verizon Center in Washington, DC. NFL Players: The protest by Kaepernick and other NFL players was never about the flag — it was about the unjust treatment of people in this country. But when the president in September linked the motives to disrespecting the flag and called players “sons of b——,” much of the league reacted. The Cowboys, including owner Jerry Jones, knelt in unison before the anthem in the game after the controversial remarks. The Washington Redskins stood and locked arms, while several members of their opponent, the Oakland Raiders, locked arms as they sat. 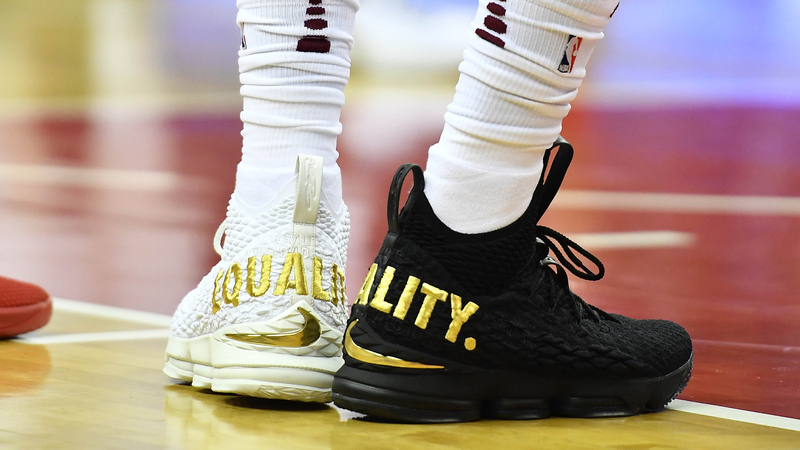 Images of many players, and even some fans, taking a knee in the weekend games that followed the president’s remarks produced the strongest sign of player unity in league history. NFL Players Coalition: In November, a group of approximately 40 NFL players began negotiations with the league about various issues, including how to deal with demonstrations during the national anthem. As a result of the discussions, the NFL offered to donate $100 million over seven years to projects addressing criminal justice reform, law enforcement/community relations and education. Jenkins was accused of having conversations with the NFL without Thomas and Reid involved. Reid also claimed that Jenkins promised the NFL that player demonstrations would end, a claim that Jenkins denied. Reid was the first player to take a knee alongside Kaepernick. The deal eventually went through, although several NFL players said they would continue with their on-field protests. 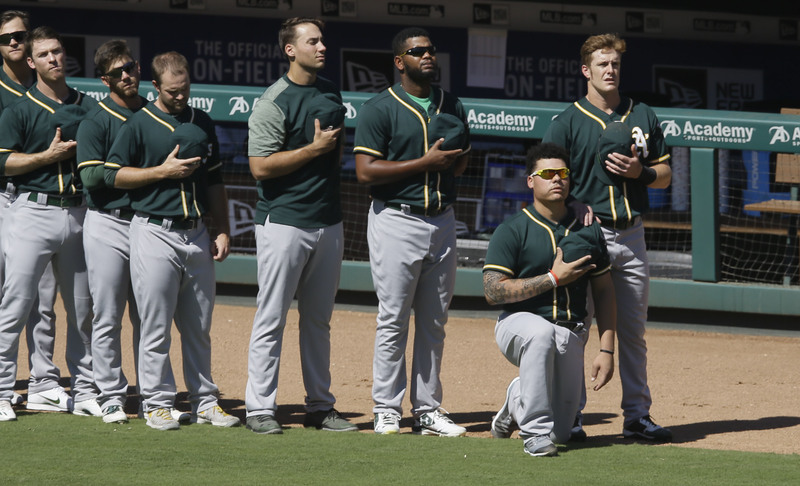 Bruce Maxwell: In September, the Oakland Athletics catcher took a knee during the anthem before a game against Texas, becoming the only MLB player to make such a statement. The move came with big risk for Maxwell. The 27-year-old made his MLB debut in July, so he’s not an established player. He was expected to be Oakland’s starting catcher next season, but an offseason arrest for allegedly waving a gun might put his status in doubt. J.T. Brown: The Tampa Bay Lightning forward became the first NHL player to raise his fist during the anthem before a game against the Florida Panthers on Oct. 7. “I love my country but that does not mean I cannot acknowledge that it is not perfect,” Brown wrote on Twitter. “I have been through more than my fair share of racism both on and off the ice.” Brown later tweeted that he was ending his protest but would take part in ride-alongs with Tampa police and also volunteer at a Florida Boys & Girls Club. When will a white player become involved? That was answered during a preseason game between the Browns and the Giants when Cleveland tight end Seth DeValve decided to take a knee with his teammates, becoming the first white player to kneel in solidarity with African-American teammates. Eagles defensive lineman Chris Long previously put his arm around teammate Malcolm Jenkins as Jenkins raised his fist during the anthem. DeValve said he was moved by the violent protests by white supremacists in Charlottesville, Virginia, that left a woman dead. DeValve also has an African-American wife. Other white players followed Long and DeValve. Oakland Raiders quarterback Derek Carr and Seattle Seahawks center Justin Britt placed their hands on the shoulders of black teammates during the playing of the anthem. Long took his gesture a step further and said he would donate his entire base salary this season ($1 million) to various charities. In the NBA, several white coaches have emerged as being woke. San Antonio Spurs coach Gregg Popovich surprised some in 2016 with his stance on social issues, and he continued to speak out this year about white privilege. Golden State Warriors coach Steve Kerr was critical of the president’s criticism of NFL players. And Detroit Pistons coach Stan Van Gundy called athletes who protest “patriots” in an article he wrote for Time. Quite a few athletes risked their careers to make a stand. Darius Moore, a senior receiver and cornerback at Clear Creek Amana High School in Iowa, took a knee before his school’s Sept. 29 game at West Delaware. When CCA decided to play the anthem before the freshman game the following week, Moore was blamed and targeted with racial epithets. The 17-year-old said part of the reason he took a knee was because of the racial profiling he experienced in his hometown. And Kennesaw State cheerleaders were criticized by a Georgia state representative and the local sheriff after they took a knee during a football game in September to protest police brutality and racial inequality. The following week, the school kept the cheerleaders in the tunnel as the anthem was played, saying the move had nothing to do with the protest. On Nov. 8, the cheerleaders were allowed to take the field again before games after the Atlanta Journal-Constitution revealed texts from the sheriff boasting about persuading the school president to keep the cheerleaders off the field. Howard University cheerleaders continued to take a knee before football games, as they had the previous season.